Paederia Foetida Linn. (syn. Paederia scandens) is considered to be an aphrodisiac and can lately be found in some testosterone boosting supplements. In India, Paederia foetida Linn. has medical value. It is also reported to be used in gout, vesical calculi, diarrhoea, dysentery, piles, inflammation of the liver and emetic . Antihyperlipidemic, antihyperglycaemic and antioxidant activity were also reported . Paederia foetida have shown that it contains compounds such as hentriacontane, hentriacontanol, methylemercaptan, ceryl alcohol, palmitic acid, stigmasterol, campesterol, sitosterol and ursolic acid . Study in otherwise healthy rats confirmed the aphrodisiac action of Paederia foetida as evident by increased mounting frequency (231%) and decreased mounting latency (31.2%). In addition, it also increased intromission frequency (222%) and decreased intromission latency (21%) . All effects were time and dose-dependent. The highest dose (200 mg/kg body weight) was comparable to testosterone injection (0.5mg/kg twice a week) after 28 days of administration. Testosterone levels were increased (dose and time dependently) in 100 and 200 mg/kg groups but not in 50 mg/kg group. The higher two doses of Paederia foetida more than doubled the testosterone level after 28 days. As evident from the chart, after 15 days the increases in testosterone were hardly significant. Besides increasing testosterone, Paederia foetida treatment is also capable of improving overall sexual behavior in healthy rats. However, this plant is currently not well-studied and no clinical studies exist. Other Benefits of Paederia Foetida Linn. Anti-inflammatory and antioxidant properties were attributed to Paederia foetida leaves extract as it was able to significantly ameliorate experimentally induced colitis . Flavonid content may have exhibited anti-inflammatory activity. While the presence of phytochemicals like alkaloids, essential oils, vitamin C and sterol was accredited to plants antioxidant action. Paederia foetida leaves extract seem to inhibit lipid peroxidation and increasing the superoxide dismutase (SOD), glutathione peroxidase (GPx), catalase (CAT) , myeloperoxidase (MPO) and malondialdehyde (MDA)  antioxidant enzymes. In streptozotocin-induced diabetic rats different doses of Paederia foetida leaf extract declined the high levels of total cholesterol and brought it normal control level . The mechanism in unknown. Paederia foetida also ameliorated the collapse in glucose metabolism in diabetic rats by improved activity of liver enzymes (glucose-6-phosphatase, hexokinase and fructose-1-6-biphosphate) . Paederia foetida exhibits marked antidiabetic and antihyperlipidemic potential. The oral acute toxicity studies did not show any toxic effect till the dose at 2000 mg/kg . Kumar, Vikas, et al. “Pharmacognostical and phytochemical study on the leaves of Paderia foetida linn.” International Journal of PharmTech Research 1.3 (2009): 918-920. Kumar, Vikas, et al. “Pederia foetida Linn. leaf extract: an antihyperlipidemic, antihyperglycaemic and antioxidant activity.” BMC complementary and alternative medicine 14.1 (2014): 76. Vikas, Sharma, Chauhan Nagendra Singh, and V. K. Dixit. “Effect of ethanolic extract of Paederia fetida Linn. 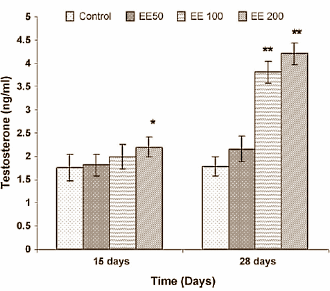 leaves on sexual behavior and spermatogenesis in male rats.” (2013). Das, Swarnamoni, et al. “Effect of ethanolic extract of leaves of Paederia fotida Linn. on acetic acid induced colitis in albino rats.” Indian journal of pharmacology 45.5 (2013): 453.